Removable denture is a dental prosthesis, Complete or partial, that replace on or several teeth. It may be removed and replaced at will for the purpose of cleaning and brushing it. The partial removable denture is supported on the gingiva and the existing teeth with hooks. 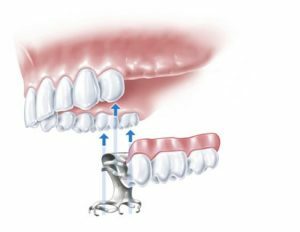 While the total removable denture is supported on the gingiva to replace the teeth of the jaw. A dental impression is taken before hand to allowing the manufacturing of the denture. A temporary prosthesis may put on before installing the final one. This solution restores the shewing function but it is not as aesthetic and comfortable as the installation of dental implants. However, when the budget does not allow it, the installation of a removable prosthesis is an alternative.